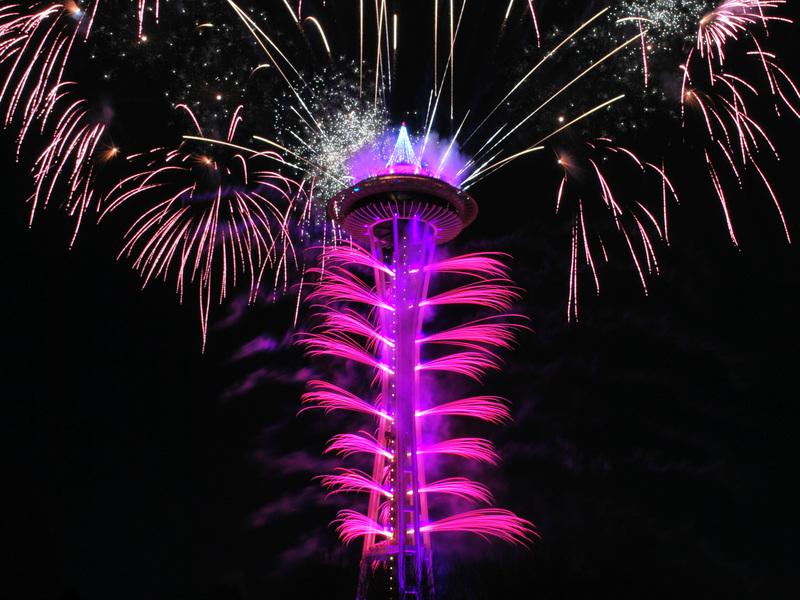 There’s no better way to ring in the New Year than watching fireworks shoot off the Space Needle. You can see the iconic landmark all over the city, but some spots are much better than others. 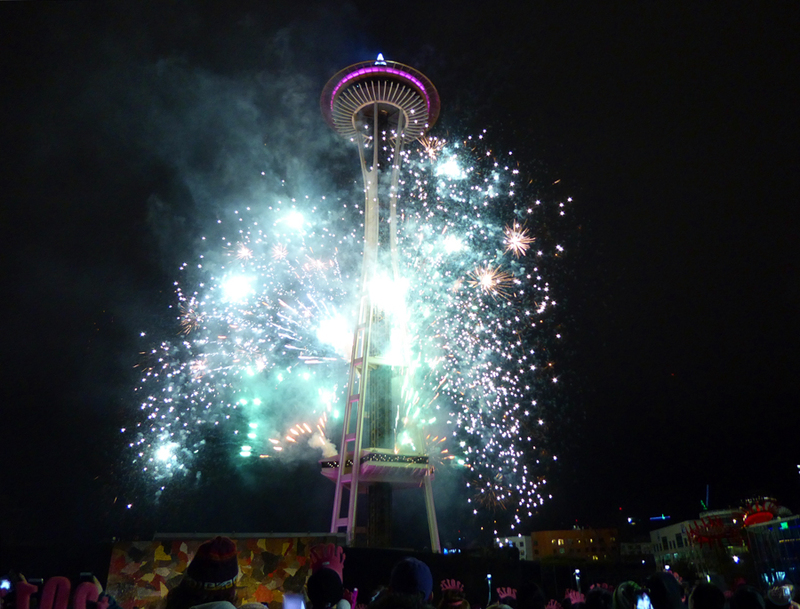 Here’s our list of the best places to watch New Year’s Eve fireworks in Seattle. There’s no better place to watch the New Year’s Eve fireworks in Seattle than the home of the Space Needle itself. You have great views of the Space Needle all over Seattle Center, and the city also shuts down the streets in front of the Space Needle before midnight. So…grab a drink in Belltown, stroll to Seattle Center, and enjoy the fireworks show. If you don’t mind spending money, you can check out the New Year’s Eve celebration at Chihuly Garden and Glass. Families can also explore Seattle Center Winterfest. NOTE: The featured video for this post was captured across the street from the Space Needle at KOMO Plaza. There’s arguably no more iconic view of Seattle than the one you find at Kerry Park. The Space Needle is the centerpiece of the view, which makes it an ideal place to watch the New Year’s Eve fireworks in Seattle. If you’d like to avoid some of the crowds, check out these secret views of Seattle from Queen Anne Hill. Ward Springs Park is also a sleeper location for New Year’s Eve fireworks in Seattle. If Kerry Park isn’t the best viewpoint of the Emerald City, the Seattle skyline view from West Seattle takes the cake. Not only do you have an unobstructed view of the Space Needle, you also get a beautiful look at the entire city as the clock strikes midnight. Seacrest Park is one of our favorite spots, but anywhere along Harbor Avenue (map) will do. You can also find great views from Hamilton Viewpoint Park (map) and Belvedere Park (map) in West Seattle. If you have a boat, a friend with a boat, or any other means of getting on Elliott Bay for the New Year’s Eve fireworks in Seattle, than jump on board. The same unobstructed views you get of the Space Needle from West Seattle, you also see from Elliott Bay (only closer!). If you’re not well-connected to the boating world, Argosy Cruises offers different sailing options to view the New Year’s Eve fireworks on Elliott Bay. Known more for the Fourth of July fireworks show in Seattle, Gas Works Park is still a spot for folks on New Year’s Eve. Along with a partially obstructed view of the Space Needle, Gas Works Park also offers an awesome look at downtown Seattle. You can find other views of the Space Needle around Lake Union, including Westward, White Swan Public House, and even Lake Union Park (map). Also, much like Elliott Bay, you can take a boat out on Lake Union for views of the New Year’s Eve fireworks show. While views of the Space Needle are much more popular from Queen Anne Hill, there are still some good places to watch the New Year’s Eve fireworks in Seattle from Capitol Hill. If Volunteer Park (map) is open (please note the if), there’s a unique view of the Space Needle from the Black Sun Sculpture. While it’s not the most peaceful spot (running parallel to I-5), there are views of the Space Needle from Lakeview Boulevard East (map). While most of the viewpoints in Magnolia offer fairly obstructed views of the Space Needle, it’s still a place you can scope out for New Year’s Eve fireworks in Seattle. Ella Bailey Park, Ursula Judkins Viewpoint (and the Magnolia Bridge), there’s even a partial view of the Space Needle from the Magnolia Boulevard viewpoints. These are some of the best places to watch New Year’s Eve fireworks in Seattle, but once again, there are views of the Space Needle all over the city. Pick a spot, enjoy the show, and have a safe and happy New Year! What’s your favorite spot for New Year’s Eve fireworks in Seattle? We’d love to hear from you! Please leave a comment below or connect with us on Twitter, Facebook, and Instagram. Don’t forget to also check out Seattle Bloggers for more great places to visit during the holidays around the Emerald City!